Sound Healing Workshops are often a part of our retreats. Our dear friend, Preet Kaur joins us regularly and the workshops are beautiful, very healing experiences. The gong is a sacred and ancient instrument of healing, rejuvenation and transformation. The gong is the greatest synthesizer in the world. It synthesises everything so that it comes into functional harmony. To heal is to make whole, so where there is functional harmony and holistic resonance, healing takes place naturally. On a physical level, the gong releases tension and blocks in the body, it stimulates a higher functioning of the glandular and nervous system, it increases prana, our vital life force and improves circulation. The gong also works deeply on the mental, emotional and spiritual bodies. The gong purifies and quietens the mind. It literally cuts through the linear mind and clears the clutter from the subconscious mind to reveal the radiant and authentic self. It has the capacity to bring us to our neutral mind that is wise and non-judgemental. It helps turn the mind to zero, a state of stillness where innate wisdom can be accessed. Another benefit that comes from the mind stilling, is repair at the DNA and cellular level allowing deep healing to take place. 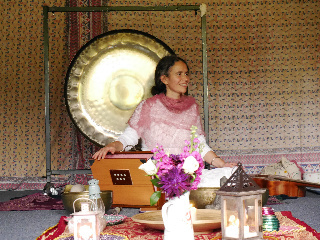 Join Preet Kaur for a sacred sound healing meditation. We will prepare our self to receive the healing vibrations of the gong with breath, mantra and relaxation exercises, then all there is left to do is to lie down and allow the healing waves of the gong to penetrate deep into our being allowing healing to take place. Preet Kaur is a Kundalini Yoga teacher, sound healer, musician, singer, acupuncturist and Reiki Practitioner. She teaches regular Kundalini Yoga classes, one to one sound healing sessions and facilitates workshops and retreats in sound healing and Kundalini Yoga in the UK and abroad. Please note: Sound healing is not suitable for anyone who is pregnant or who suffers with Epilepsy, please contact us if you have any concerns about whether joining a sound healing workshop is right for you.